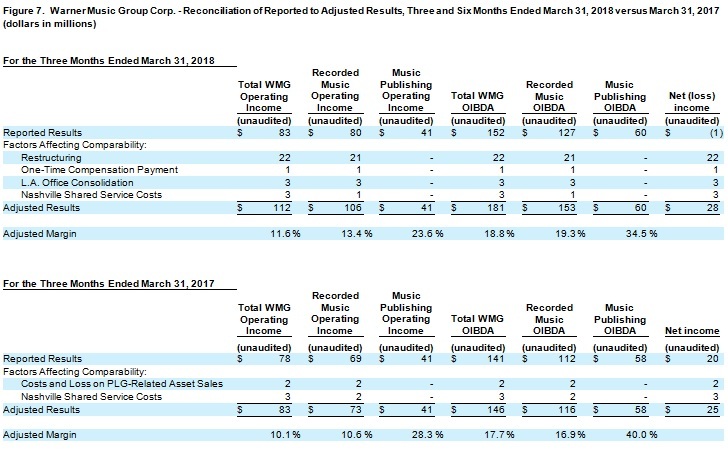 Warner Music Group Corp. today announced its second-quarter financial results for the period ended March 31, 2018. Revenue grew 16.7% (or 10.4% in constant currency). Growth in Recorded Music digital, physical and licensing revenue and all segments of Music Publishing revenue were partially offset by a decline in Recorded Music artist services and expanded-rights revenue. Revenue increased in all regions. Digital revenue increased 24.6% (or 19.7% in constant currency), and represented 56.8% of total revenue, compared to 53.2% in the prior-year quarter. 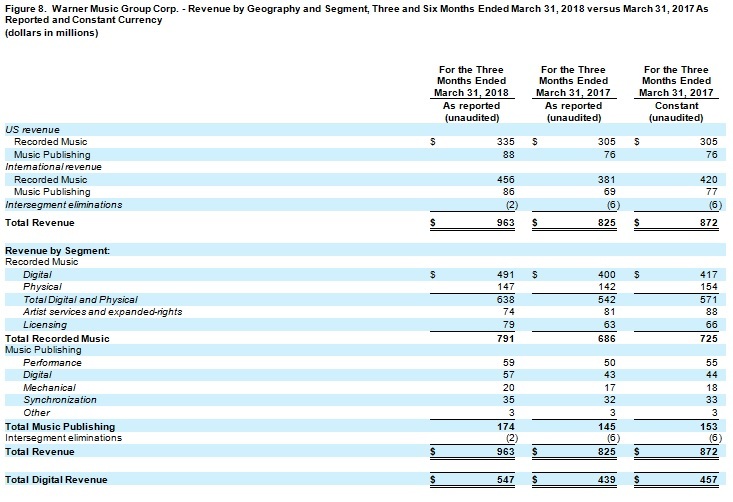 Operating income was $83 million compared to $78 million in the prior-year quarter. OIBDA rose 7.8% to $152 million from $141 million in the prior-year quarter and OIBDA margin declined 1.3 percentage points to 15.8% from 17.1% in the prior-year quarter. The increase in operating income and OIBDA was largely the result of higher revenue partially offset by restructuring costs and an increase in facilities costs related to the Company’s Los Angeles office consolidation. Adjusted OIBDA rose 24.0%, benefiting from revenue growth and Adjusted OIBDA margin improved 1.1 percentage points to 18.8% as a result of revenue growth and revenue mix. Net loss was $1 million compared to net income of $20 million in the prior-year quarter and Adjusted net income was $28 million compared to Adjusted net income of $25 million in the prior-year quarter. The net loss was primarily attributable to a loss on extinguishment of debt of $23 million related to the partial redemption of the Company’s 6.75% Senior Notes, and higher non-cash tax expense in the quarter related to a one-time tax benefit in the prior-year quarter, offset by higher operating income. These factors more than offset lower other expense largely related to a currency-related gain on intercompany loans and improved operating income. Adjusted operating income, Adjusted OIBDA and Adjusted net income exclude certain costs related to the relocation of the Company’s U.S. shared service center to Nashville, the Company’s Los Angeles office consolidation and restructuring in the quarter, and certain costs mainly related to the Nashville relocation and PLG-related asset sales in the prior-year quarter. See below for calculations and reconciliations of OIBDA, Adjusted operating income, Adjusted OIBDA and Adjusted net income. 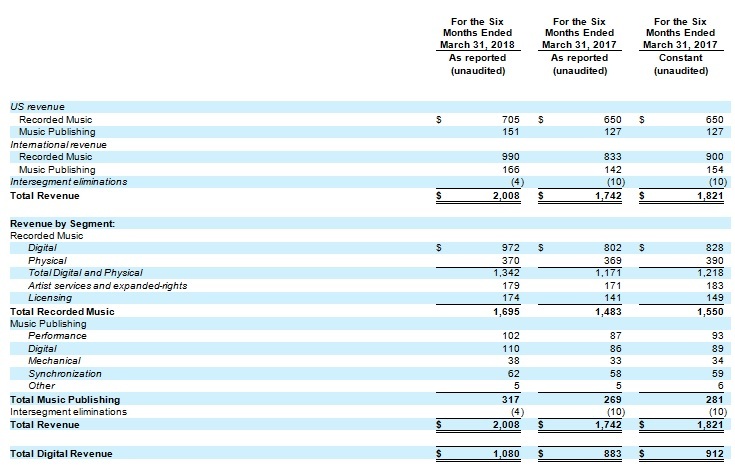 As of March 31, 2018, the Company reported a cash balance of $612 million, total debt of $2.947 billion and net debt (total long-term debt, which is net of deferred financing costs of $33 million, minus cash) of $2.335 billion. Cash provided by operating activities was $0 compared to $70 million in the prior-year quarter. The change was largely a result of movements in working capital related to the payment of annual bonuses and other variable compensation, and timing of royalty payments. 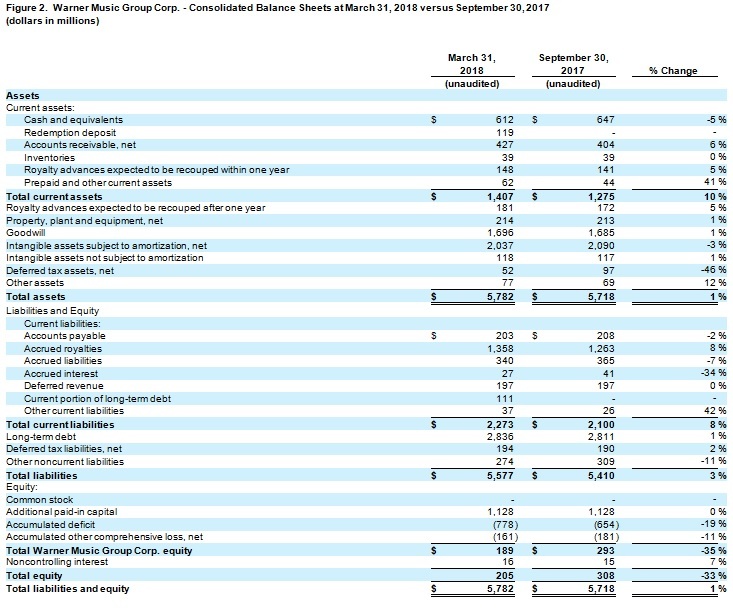 Free Cash Flow, defined below, was negative $22 million compared to $70 million in the prior-year quarter, reflecting the change in cash provided by operating activities, and the impact of sale of investments in the prior-year quarter. Recorded Music revenue grew 15.3% (or 9.1% in constant currency). Growth in digital, physical and licensing revenue was partially offset by a decline in artist services and expanded-rights revenue. Digital growth reflects a continuing shift to streaming revenue. Licensing revenue rose due to higher broadcast fee income and increased synchronization activity. The increase in physical revenue was largely currency-related. The decline in artist services and expanded-rights revenue was largely due to increased concert promotion and merchandising activity in the prior-year quarter. Recorded Music revenue grew in all regions. Major sellers included Ed Sheeran, The Greatest Showman soundtrack album, Bruno Mars, WANIMA and Dua Lipa. 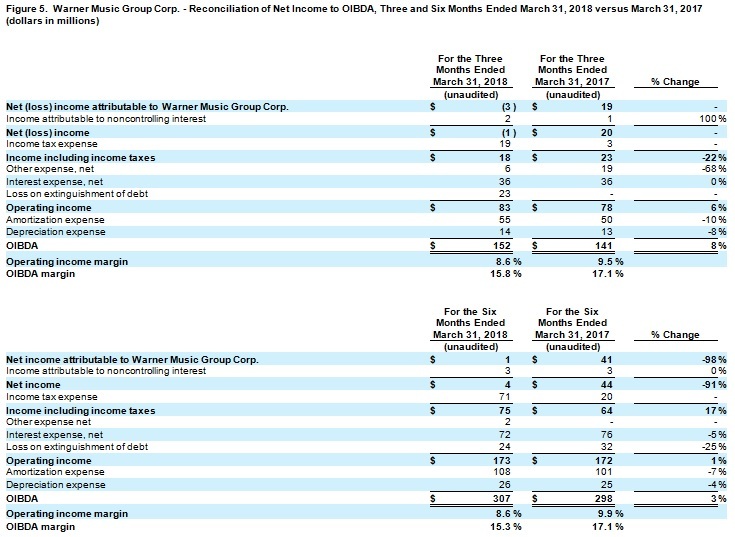 Recorded Music operating income was $80 million up from $69 million in the prior-year quarter, and operating margin was flat at 10.1%. 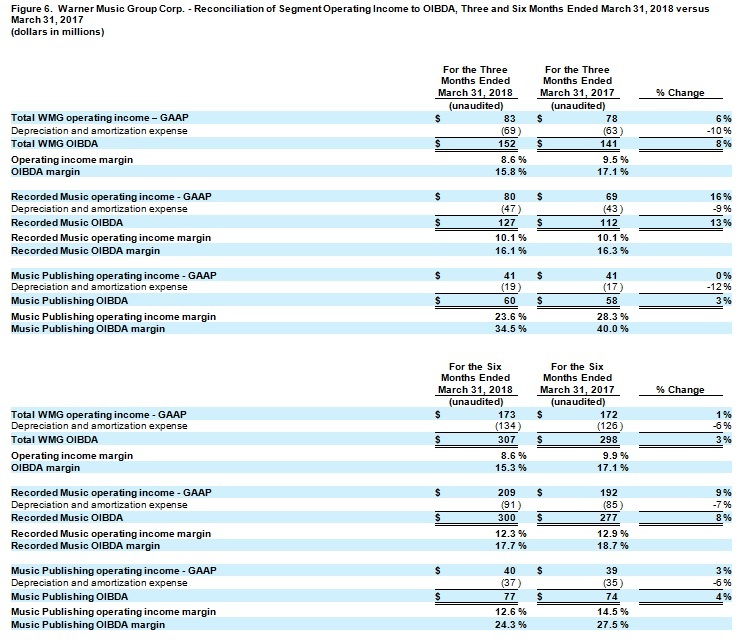 OIBDA rose 13.4% to $127 million from $112 million in the prior-year quarter driven by revenue growth. OIBDA margin declined 0.2 percentage points to 16.1% due primarily to restructuring costs and an increase in facilities costs related to the Company’s Los Angeles office consolidation. Adjusted OIBDA was $153 million up from $116 million in the prior-year quarter and Adjusted OIBDA margin was up 2.4 percentage points to 19.3% reflecting the benefits of revenue mix. Music Publishing revenue rose 20.0% (or 13.7% in constant currency). Revenue grew in all segments – digital, performance, synchronization and mechanical. 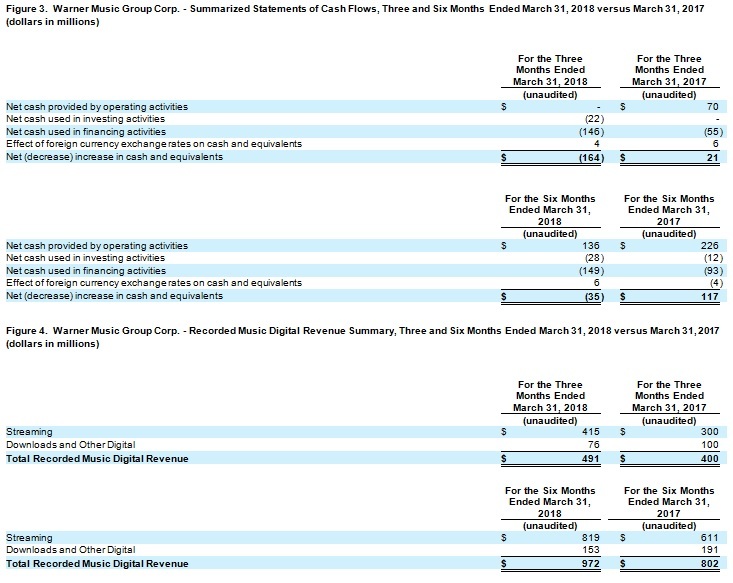 Music Publishing operating income was flat at $41 million. 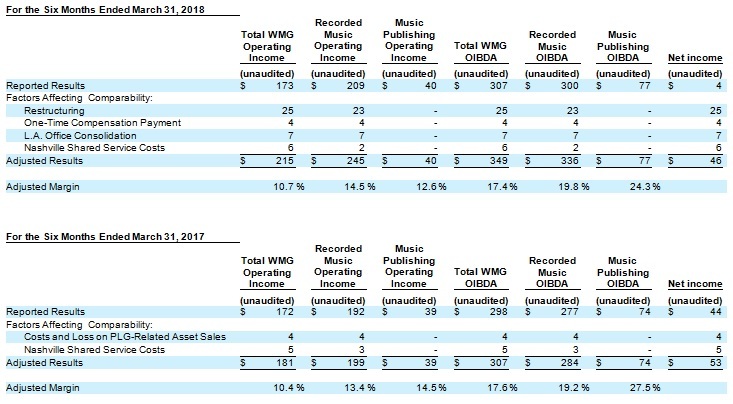 Music Publishing OIBDA rose by $2 million to $60 million and Music Publishing OIBDA margin declined by 5.5 percentage points to 34.5%, largely due to revenue mix. Financial details for the quarter can be found in the Company’s current Form 10-Q, for the period ended March 31, 2018, filed today with the Securities and Exchange Commission. This morning, management will host a conference call to discuss the results at 8:30 A.M. EST. The call will be webcast at www.wmg.com. The Company maintains a 52-53 week fiscal year ending on the last Friday in each reporting period. As such, all references to March 31, 2018 and March 31, 2017 relate to the periods ended March 30, 2018 and March 31, 2017, respectively. 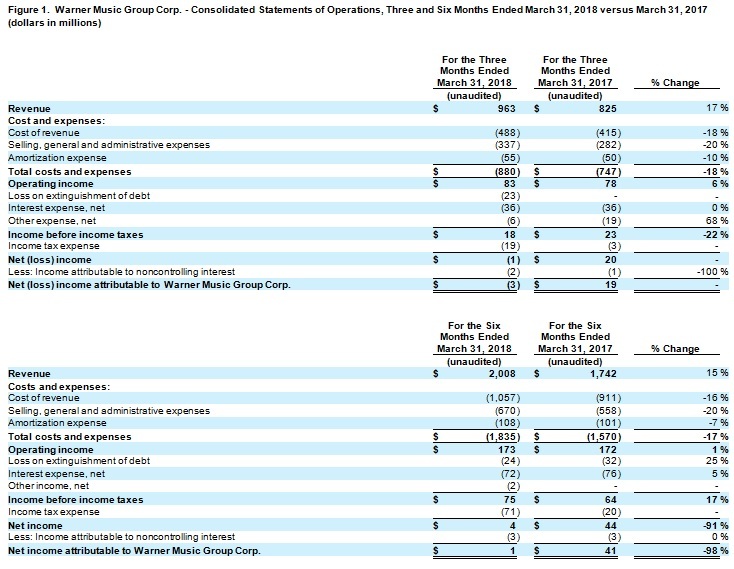 For convenience purposes, the Company continues to date its financial statements as of March 31. The fiscal year ended September 30, 2017 ended on September 29, 2017.